Marriner Stoddard Eccles was a banker, financier, and economist considered the father of the Federal Reserve. 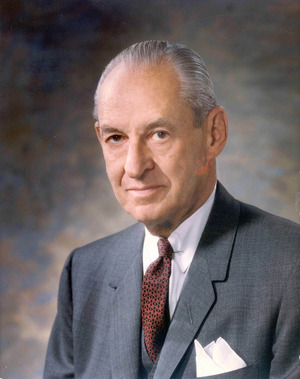 He served as assistant to the Secretary of the Treasury and was appointed Chairman of the Federal Reserve by U.S. president Franklin D. Roosevelt. The Federal Reserve Building in Washington, D.C., was renamed in 1982 in his honor. Eccles was born on September 9, 1890, in Logan, Utah. He was the oldest of nine children born to David Eccles and his wife, Ellen Stoddard Eccles. His high school education was obtained at Brigham Young College. He then served as a full-time Missionary to Scotland, his father’s native land. He was a member of The Church of Jesus Christ of Latter-day Saints. He worked in one of his father’s businesses in Blacksmith Fork Canyon. When his father unexpectedly died in 1912, Eccles reorganized and consolidated his father’s assets, and expanded the banking interests into the Eccles-Browning Affiliated Banks. In 1916, he created the Eccles Investment Company. In June 1928, Eccles and his brother George S. Eccles and E. G. Bennett of Idaho Falls organized the First Security Corporation as a holding company to manage a savings and loan institution and the seventeen banks that the company had acquired. The company withstood several Great Depression-era bank runs. Eccles is credited with helping struggling Intermountain West banks stay in business during the Depression. In 1933, Congress invited him to give his analysis of the Great Depression. In his testimony, he proposed a five-point program to fix the economy that formed the basis of the New Deal. He helped draft the Emergency Banking Act of 1933, the Federal Housing Act of 1934, and the 1933 act creating the Federal Deposit Insurance Corporation. Eccles was instrumental in drafting the Banking Act of 1935, which restructured the Federal Reserve system into its present form. He was chairman of the Federal Reserve Board from November 15, 1934 until his resignation on January 31, 1948. He remained a member of the board until July 14, 1951, when he resigned and moved to Utah, where he was active in his banking company. He also wrote his memoir, Beckoning Frontiers. He wrote and lectured about three issues that concerned him: world over-population, the Vietnam War, and the need for the United States to recognize Red China. He was the U.S. delegate to the Bretton Woods Conference held in 1944, which established an international monetary system that included fixed exchange rates. At this conference, the World Bank and International Monetary Fund was created. Eccles founded the Marriner S. Eccles Library and Graduate Fellowship of Political Economy at the University of Utah, and the Marriner S. Eccles Foundation, which has funded many charitable, scientific, and educational organizations in Utah. In 1943, he was awarded an honorary doctor of laws degree from the University of Utah. Utah State University awarded him an honorary doctorate in 1963. Eccles married May “Maysie” Campbell Young in 1913. They had four children, one of which died at a young age. They divorced in 1950. He married Sara “Sallie” Madison Glassie in 1951. He died December 18, 1977. A statue of him was installed on the grounds of the Utah State Capitol on September 16, 2014. On plaques at the base of the statue, he is called a statesman and public servant. This page was last edited on 22 January 2019, at 16:53.